Prepare quinoa according to package instructions and transfer to a large mixing bowl. In a small mixing bowl, combine 3 tablespoons oil, lemon juice, lemon zest, garlic, basil, salt and pepper. Whisk to combine. Combine quinoa with half of the lemon basil mixture. Mix thoroughly. In a small mixing bowl, combine shrimp and remaining lemon basil mixture. Reserve in refrigerator. Lay pepper halves skin side down in a casserole dish. Stuff each pepper with ½ cup quinoa mixture and sprinkle with parmesan. Cover with foil and bake for 30 minutes. Uncover and continue baking for 10 minutes or until cheese is slightly browned and peppers are tender. Meanwhile, heat remaining 1 tablespoon oil in a sauté pan over high heat. Add shrimp and sauté for 3-4 minutes or until shrimp are cooked through. 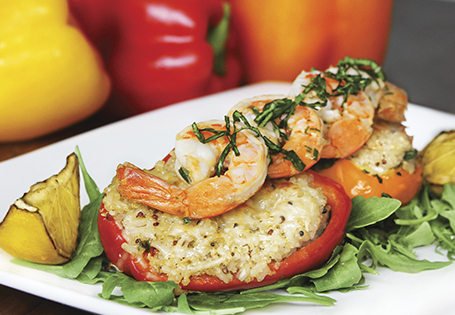 Transfer peppers to a plate and top with 4-5 shrimp each.